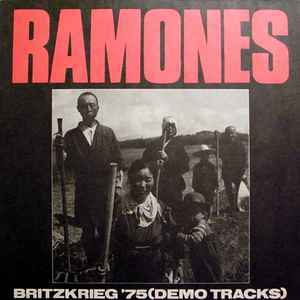 Alternate edition of the Showa LP in a false sleeve that credits the record as "Ramones - Britzkrieg '75 (Demo Tracks)" and features a false tracklisting. The Gerogerigegege is not mentioned anywhere in the sleeve. Catalog number on sleeve is 'VDR/LP010', while catalog number on LP center label is 'VLP-010' (same as Showa LP). Some copies of this record contained the Ai-Jin flexi disc as an insert.